1. Is there one character you relate to more than any other in this story? If so, why? 2. How well do you think Francesca Hornak captures the family dynamic of a week in quarantine over the holidays? 3. Do you think it was better/right for Andrew to conceal his one-off infidelity with Jesse’s mother? Or should he have spoken up and told Emma at the time? 4. Why did Olivia stay away from her family for so long? Have you ever experienced the feeling of not being able to be yourself with your family? 5. Discuss the sibling rivalry between Olivia and Phoebe. Why do you think we, as adults, fall into old roles when home with family? Have you experienced this? 6. What do you think kept Phoebe and George together for six years? 7. Did you empathize with the way each character reacted to Jesse’s surprise arrival? Did you empathize with Jesse? 8. Is there a moral lesson that each character takes away with them at the end of the story? If so, what is that lesson? 9. What are the main themes in the story? 10. Do you like the way the story is told from multiple points of view? 11. The end is tinged with tragedy and hope. How did the ending affect you? 12. What do you imagine or hope would happen next for each of the members of the Birch family after the closing pages of the book? What compelled you to write Seven Days of Us? In 2014 my oldest friend went to treat Ebola in Sierra Leone, and afterwards, she and her family had to spend December in quarantine. When she told me, I couldn’t stop thinking about the idea of a quarantine intensifying the familiar Christmas set-up and how that pressure cooker could make a neat start to a novel. On a more prosaic level, I found out I was pregnant soon after I began writing—so after that it was a race to birth the novel before the baby. I was editing when I went into labor. Which of the Birches—Olivia, Phoebe, Emma or Andrew—do you relate to the most? Warning: spoiler alert! On paper I’m sorry to say that I’m most like the bratty, blinkered Phoebe but I felt for them all in different ways. I relate to Emma as a mother and an inveterate worrier, and her impulse to uphold family traditions. And Andrew’s rage at his words being edited is annoyingly familiar to me as a journalist. I found earnest Olivia’s head hardest to get into, though I think we can all identify with resenting your family and wanting to be the adult you are at work, at home. Plus, we were both pregnant so we had that in common. Were any of the characters based on someone you’ve met before? Not consciously! But my older brother is definitely more intrepid and aloof than me so the dynamic between the siblings has some basis in my own experience. And at university in Oxford, I met lots of men like George Marsham-Smith . . . I only had myself to blame, as I chose an athletic college thinking there would be less academic work, which wasn’t even true. If you were forced into quarantine with your family, what would you find most challenging? Most rewarding? We practically were in quarantine last Christmas because I roped my poor family into intensively potty training my son. We barely left my parents’ holiday home for a week. I’m ashamed to say that I struggled with my father’s insistence on hoarding moldy condiments (whenever I try to bin mustard with a 2010 date stamp I get accused of being ‘the fridge police’), and my mother’s tendency to launch into very in-depth conversations at breakfast. I should be mature enough to find these things endearing, but family makes you regress! The most rewarding thing about being at home is always watching my parents and my children together. Seeing your mum and dad as besotted grandparents is very special—it softens everyone and breathes new life into the house. Share your funniest (or most cringe-worthy) family holiday story or tradition. When my brother and I were little, we used to get so hyperactive that we were allowed to open one present under the tree on Christmas Eve. It became tradition to deliberately pick a present that was likely to be a bit rubbish so you got it out of the way and weren’t disappointed on Christmas Day.We had certain relations who could be relied on to send a terrible gift—some of our top Christmas Eve openings were a 1,000-piece jigsaw of baked beans, a negligee (when I was seven . . . ) and a huge empty box. I wasn’t aware of our traditions being cringey until my husband started spending Christmas with us and was slightly aghast that we still all make stockings for each other when my brother and I are well into our thirties. We also persist with real candles on the tree, even though it once caught fire and my grandmother had to throw the whole thing out of the front door. The uncommunicative Birches are in stark contrast to the novel’s sunny Californian, Jesse. What is your take on the cultural differences between the U.S. and the UK—is that intentional? From the start I felt Andrew’s son should be foreign but English speaking, so I chose to have him from the U.S. It was only when I started to write in Jesse’s voice that I realized his Californian positivity and emotional fluency was a good foil to Andrew’s cynicism and the Birch family’s stiff upper lip. So it wasn’t deliberate, but I was probably unconsciously drawn to portraying those cultural differences as I’m a natural sceptic myself (much as I’d love not to be), and I really envy the enthusiasm and straightforwardness that seems to be the norm in the states. The British embarrassment threshold can be painfully low! That said I think there’s a new generation of Brits who are already more like Jesse than the Birch family because of all the motivational mottos floating around Instagram . 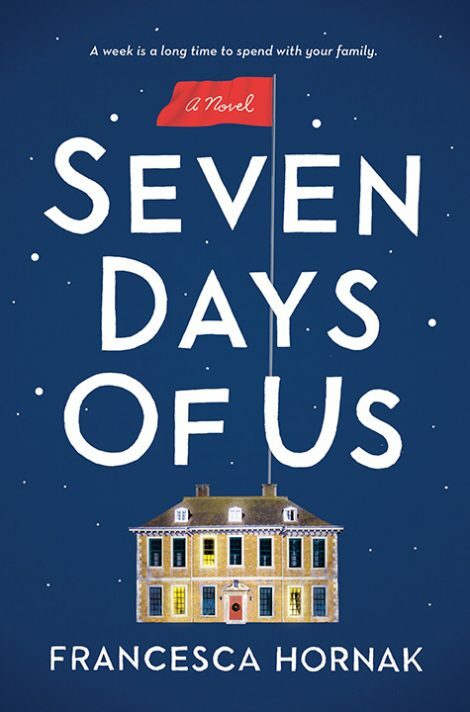 . .
What do you hope readers take away from Seven Days of Us? That family dynamics aren’t set in stone and that it’s never too late for relationships to turn around. I loosely based the plot on the parable of The Prodigal Son, as I’ve always been drawn to the idea of second chances.